Rocky is a dark brindle male that had an unusually long racing career racing- until he was 5 years old. He turned 5 on October 3rd. Rocky is a small guy that raced at 67lbs. His sire is the famous Lonesome Cry which makes him a half brother to quite a few dogs we have placed. His dam is Taylor Uhi. Rocky passed his cat test at the track and has been fine with small dogs he has met. 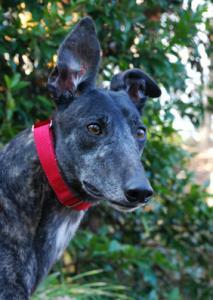 He plays nicely with the female greyhound in his foster home Rocky is a calm guy that is well behaved. He crated well and traveled well on his trip up from the track. He walked nicely on leash and eliminated on leash so might be able to go to a home without a fenced yard. Rocky seems like a friendly, happy guy that likes everyone he meets including the children in his foster home. He loves to give kisses. He is very smart and has learned quickly how to be a well behaved house dog. He learned how to walk on slippery wood floors by watching the other dogs do it and does stairs with no problem. Rocky lets you know when he needs to go outside too. He has a gorgeous shiny dark coat with very light almost silvery stripes. He is just stunning.